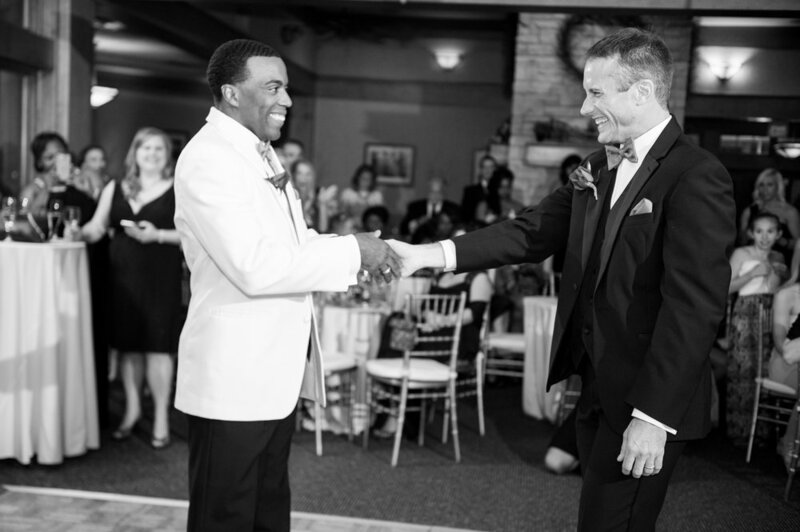 Brent + Kevin had a beautiful, black-tie wedding on Saturday at Stone Creek Golf Club in Urbana. The outdoor ceremony was rained out by the storm that rolled through that afternoon, but no one was phased and the wedding went off without a hitch! You won't see many portraits in this post as Kevin + Brent requested mostly candids and to spend the majority of the night with their guests. These two wanted a lot of drama to their wedding, and they got it! There were many performances throughout the night including: ballet, a string trio, a drag performance, and a live band, an unplanned (I think?) choreographed dance to "Single Ladies", and not to mention one of the grooms singing part of his vows! I loved loved loved their vows. They were some of the most thoughtful, heartfelt vows I've ever heard at a wedding. Two of my favorite parts were when Kevin mentioned how though his mom had passed away before they met, that she brought Brent into his life; and when Brent had his two kids Griffin & Elena help him deliver his vows. These two then danced the night away with their guests and had a grand time eating wonderful food and noshing on Lori's amazing cake and Garrett's popcorn! Leave a comment below for Kevin + Brent, and after 50 comments, they'll receive a complimentary 11x14" mounted print of their choice.